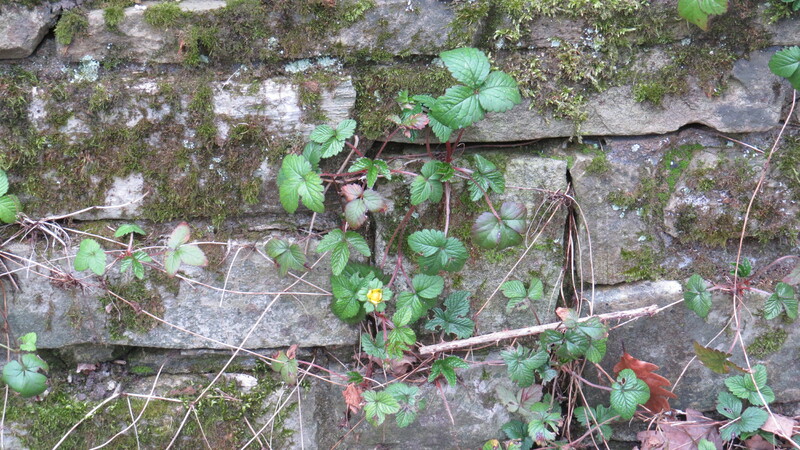 Dear Readers, I confess that I found this little plant outside of my half-mile territory – it was growing on a mossy wall at the edge of Hampstead Heath – but I was so intrigued by it that I thought I’d share it with you. 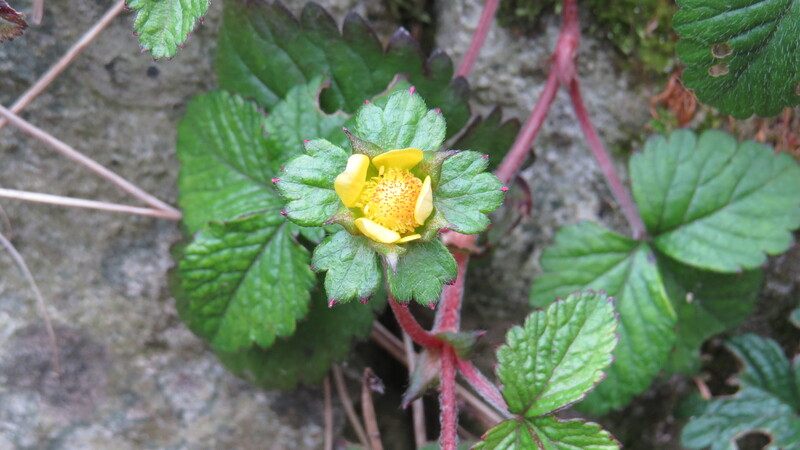 I was very puzzled when I found it: it was clearly some kind of strawberry, but the flower was bright yellow, and it wasn’t in any of my plant guides. 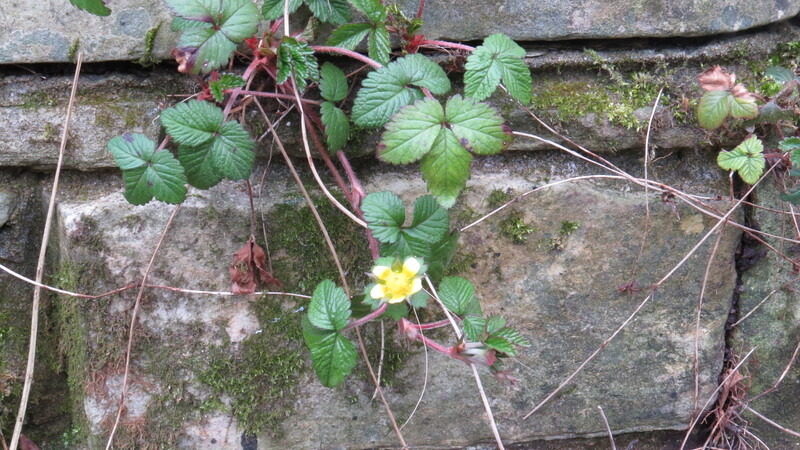 So, off I went to my friends at the UK Wildflower Facebook group, who recognised it as mock strawberry within about thirty seconds. 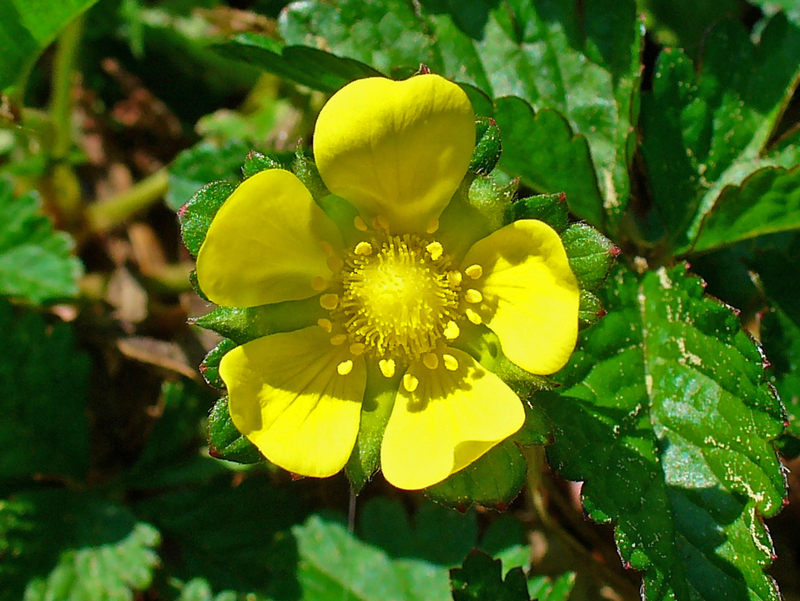 Mock strawberry is not the same as barren strawberry (Potentilla sterilis) or wild strawberry (Fragaria vesca). 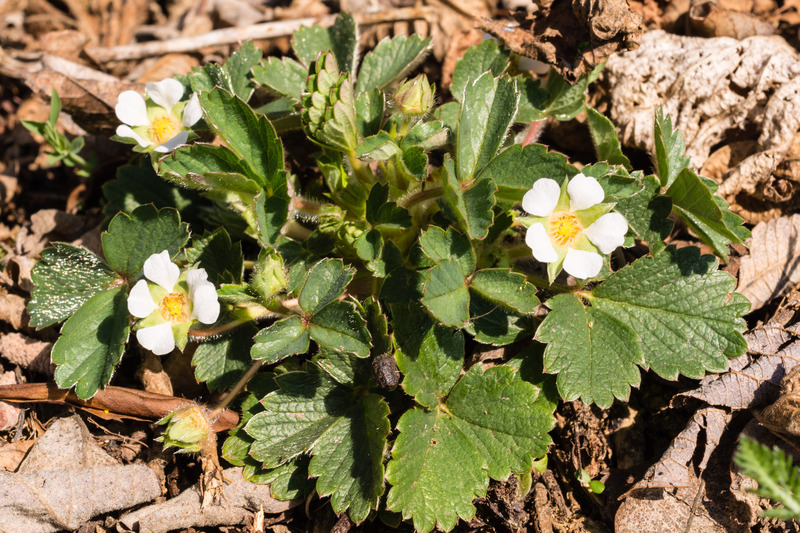 As you can see, although the leaves are very similar the flowers of both our native strawberries are white, with a much larger gap between the petals in barren strawberry. Mock strawberry is native to Asia (hence one alternative name of Indian Strawberry), and so it is another garden plant that has ‘escaped’. According to the Plant Lives website, it was introduced to the UK in 1804, and there was a craze for using it in hanging baskets during the Regency period of 1810 to 1820. I can well imagine how pretty it would have looked, and how enthusiastically it would have fallen from its lofty perch and headed off into the undergrowth. Mock strawberry does have ‘strawberries’, although these are said to taste like a rather insipid watermelon. However, on the ever-interesting Eat the Greens website, Green Deane considers that maybe the fruits are suffering from ‘negative exaggeration’ – they look so palatable that it is a disappointment when they taste a little bland. Deane describes how the leaves can be used as a pot herb, or as a pleasant tea when dried. The berries can be used to make a jelly or jam, and to stretch other berries when making preserves. 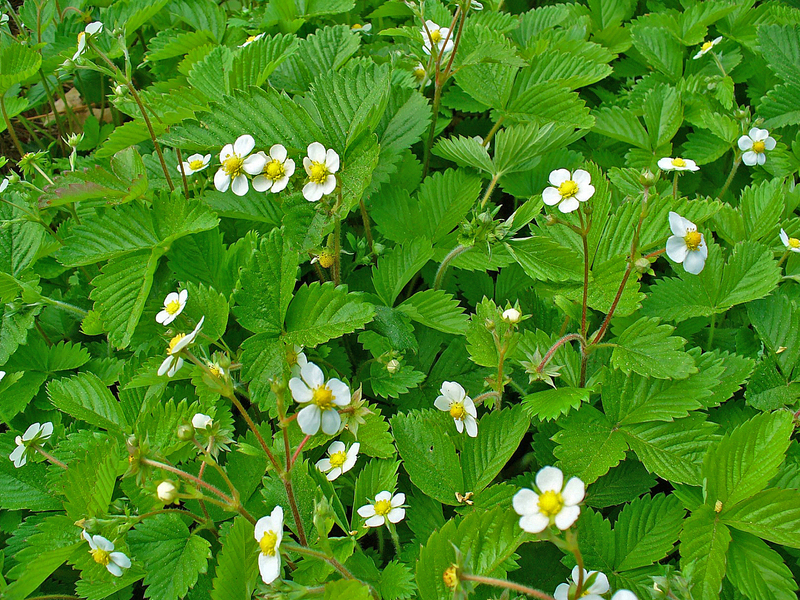 Plus, it can be a useful ground cover plant in the garden (though here I might incline more to using wild strawberry, because I have a passion for the intensely flavoured berries). 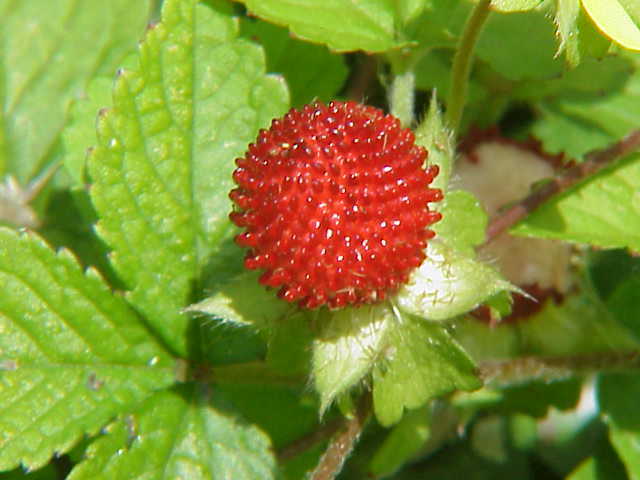 The mock strawberry is listed as a noxious weed in many parts of North America and Europe, and also on vulnerable islands such as Reunion. This is in part due to its modes of reproduction. The plants have both male and female flowers, and so are ‘perfect’ – capable of self-pollination if there are no pollinators around to encourage genetic diversity. 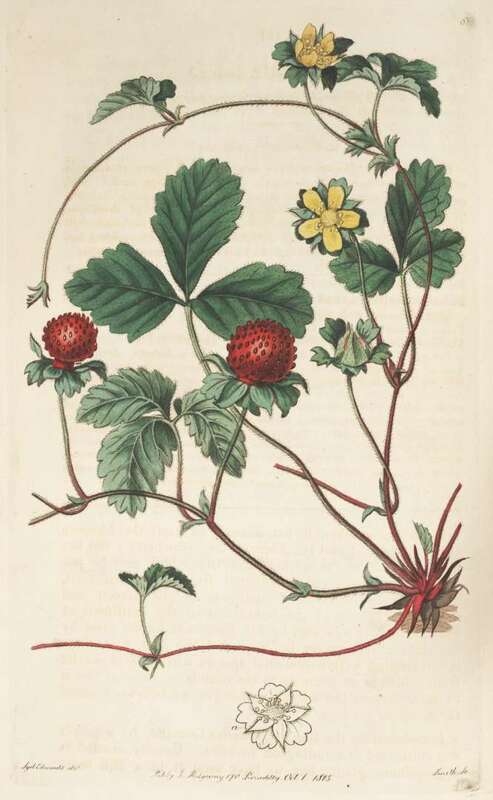 However, like other members of the strawberry family, it can extend its reach by ‘runners’, which erupt as baby plants a good distance from the ‘parent’. So, when times are hard the mock strawberry can go in search of nutrients without the original plant moving an inch. Another human use for mock strawberry is as a pesticide – it has a long history in Asia of being used not only to cure malaria, but also to kill mosquitoes who might carry the disease (though I’ve yet to discover what part was used, and how). What a useful plant this is, even though its fruits might not be altogether to human taste. Nearly all of the websites that I’ve visited to research this plant state that it was used in India as an offering to the gods. However, as exactly the same sentence seems to be replicated in each one, it may be that it’s one of these factoids that chases round and round the internet without my ever being able to get to the bottom of the story, which I find rather frustrating. I would love to be able to share the details of where, how and why it featured in such ceremonies, if indeed it ever did, and if any of my readers can enlighten me (and the rest of us) I would be delighted to hear from you! Photo Five – credit below. This entry was posted in London Plants on March 30, 2016 by Bug Woman. What a pretty little much overlooked plant with such a diverse history and usage!